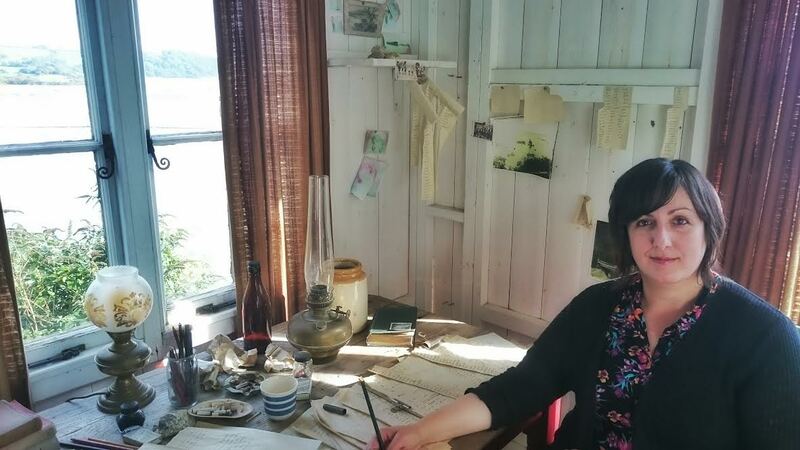 Welsh Writers Trust sat down with Mab Jones, writer and performer, and chatted to her about the residency she is doing at the Dylan Thomas Boathouse in Laugharne. You are doing a residency at the Dylan Thomas Boathouse, what does this residency entail? They have a few resident writers over the course of a year and they’re all doing slightly different things. Part of it is that you write your own work, I mean that’s inevitable you’re a writer, that will happen wheverever you go anyway. With myself it was a little bit different to say Johnathan Edwards who was there a month before, he did very specific writing, where as mine was over the Summer months where they have a lot more visitors and a lot more families, so it was more to do with engaging the public. I asked visitors to write a word or a line or two or a even a little poem about the house or Dylan or the view or their holiday or something like that and I’ll be taking a little bit of all the visitors’ writing and making probably two groups poems because I have collected 500 bits of paper. Also poems are in different areas around the house, kind of like an installation, it’s very visual, it’s very tactile. People can read the words of everyone who has come through and taken part and most people have. There is one [installation] around the fireplace, it’s in the shape of different love spoons and it looks really cosy. One is Japanese themed, it looks like a very colourful pair of curtains but when you look [closer] its small squares of paper and there are about 200 or 300 of those, there’s a lot of those. There’s some Japanese cranes, some origami cranes up there too which I made with the childern. There’s one up in the musuem which is a poetry washing line, basically sock shaped paper, and that was outside but it’s too wet for it to stay out there. There are poetry postcards which I’ve yet to put up, they’ll be up this weekend and that’s where people write something as if they’re sending a postcard from the boathouse, that’s more prose than poetry, poetic prose perhaps. I also did a couple of evenings of performance and did some Japanese storytelling because I was in Japan learning that earlier this year thanks to a Creative Wales Award. I also read some poems I’ve written in the boathouse and in Japan and as resident poet in the National Botanic Garden of Wales which I was for the past few years. How much control do you have over the space? Can you do exactly what you want to do? Well I had pitch my idea to Eleri who works for Carmarthenshire council and she thought it was a fantastic idea so booked me to do this. It was supposed to be a month and she asked me to do two months, which is very interesting because last month there were lots of families and this month more older people. They are all still up for it, not any difference there. I’m just maybe not doing the poetry socks this month, there is a different focus, away from the colourful socks, for the adults. In terms of the visitors who come along how to they interact with you, the space and your activities? It’s case by case. You get the very odd person who’s like no, no. Some people there say that they can’t do that, that they’re not creative. That’s not true because creativity is everything and if you can speak to say that then you are creative because you just made up an answer yourself, out of your own brain. It’s just thinking and speaking. So they’re always a bit of a challenge but I just encourage them to write a word or two and some of them do end up writing poems even though they say they can’t. Most people are happy to do it, to have a cake and a cup of tea and to write something. Especially because it’s on the estuary and the views are amazing. And some people who go there are just so mad about Dylan and his work that they want to write something. Also, in the parlour, which is where I am sometimes, some of the furniture is Dylan’s furniture, it’s his chair in the corner and on the opposite side it’s his writing desk which he inherited from his father, so you can always tempt them with that can’t you? Look out as this beautiful estuary and see what comes out of the pen. You’ve done other residences like the one in National Botanic Garden of Wales, how does this one differ? With this one there’s a lot more public engagement, there’s a lot of people passing through all the time, it’s a pretty constant stream. Some sit down for a chat then stick around. You’re always talking, there’s a lot of talking all day, not really any time to write anything so I’ll do that after or in the week. In the Garden [National Botanic], I mostly just wondered around, I did a couple of readings but it was most about writing there than anything else. I kind of wanted to be a bit like Wordsworth, to do that whole garden thing, it was amazing and that went on three years. But I don’t live by the Garden so I just went there as and when, where as with this one I had to be there every weekend from 10.30 til 4.30 Saturdays and Sundays, all through August and September so it’s quite specific. The other main different is they bring me a lot of cake, amazing cake. The cook in the kitchen, she’s 74 and she’s so good at baking. Foolishly or cleverly in my second or third week, I wrote a poem about the women in the kitchen and they loved it, they stuck it up on the cupboard and I had some many cakes. With being in the space, has it changed the way you write? Do you find you have developed in a different way? It kind of has. What’s happened is, I wasn’t expecting this, I did study Dylan Thomas at university but I didn’t really connect with him very well. I liked his work and I’ve read a lot of his stuff because I did it as a module but I was into Dickens, I was into the Victorian writers at Uni. But now, thanks to the Boathouse and the centenary last year, there’s been so much Dylan. Especially in the parlour where there’s like a sound recording behind me, I’m hearing Dylan read his own poems and they’re just so bloody good and they’ve got all these books in the bookshop and I’ve just been looking at them and I’m bit obsessed. I’ve been writing a few things that are influenced by him now, about his life and about the Boathouse. I’m a Dylan fan now. Being in the space where Dylan wrote, has it made you think more about your own writing space? I still haven’t got a writing desk after all these years, there’s one in the spare room but it’s not right. I’m at the dining room table and I have to clear all my stuff off. I envy the fact that he had a desk, you know it’s got all his stuff on it, it’s got all his pictures, it’s got all his books and his jacket is on the chair. He had not just his own desk, but his own writing shed which is so cool. We all know Caitlin used to lock him in his shed to do his work so he wouldn’t go out to the pub, but still to have that space and to have that desk is so important. I still haven’t quite got it so I don’t feel as rooted in some things as I could be. I’m writing a novel at the minute and I think I need a desk. I need space to work it all out. I wrote an article for CCQ magazine last year about writers and how they write and where they write. Dylan had that view which is very calming but what I find interesting is that he still was writing about people, he wrote Under Milk Wood there. I realised that in the shed that I’m more interested in people, particularly the living. With the people passing through, I’ve also managed to collect some stories that I could write for the New York Times column called Lives. I’ve been collecting stories from people but not all of them are suitable for the column so I might put a book together of people’s amazing stories. Some of them are too amazing for that column because it is about everyday life. I’ve met such unusual and not unusual people, I met someone who works in the National Museum who saw a ghost there, I met one of only 26 brain surgeons in the UK. Lots of interesting stuff. Mab Jones is doing her last weekend in the Dylan Thomas Boathouse this weekend. She’ll be in on Saturday and Sunday from 10.30 to 4.30 if you want to pop in and see what’s going on. She will also be doing the festival This Could be Beautiful run by poet Howard Ingham on Sunday night.